I wouldn’t want to use my best reliever either Charlie! Bases loaded. 2 outs. You’re up a run. You have Josh Lindblom or Jonathan Papelbon. Who do you use? 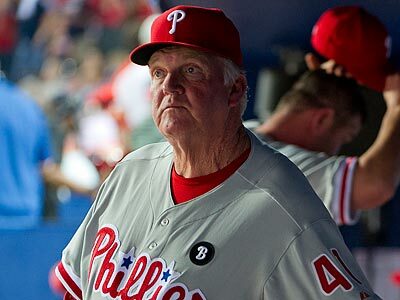 Apparently, Charlie rather use Lindblom in that spot as the Phillies lost tonight 7-4 to the Milwaukee Brewers. Corey Hart hit a grand slam with two outs in the 8th inning to give the Brewers the lead that ultimately won them the game. The terrible Livan Hernandez picked up a win while Lindblom wasted a 12 strikeout outing from Cliff Lee. Lee pitched into the 8th inning, giving up three runs on three solo home runs (two by Ryan Braun and one by Aramis Ramirez). This book is terrible Charlie, stop using it. Greg Dobbs had two hits and three RBI in 9-2 Miami Marlins win as the Phillies’ couldn’t pick up the sweep. Roy Halladay didn’t pitch all that badly, making one big mistake to Dobbs, which he hit out of the ballpark in the seventh inning. Doc was done after being lifted for a pinch-hitter in the top of 8th inning after going 7 innings, allowing three earned runs and striking out seven. The combination of BJ Rosenberg, Raul Valdez and Michael Schwimer struggled, giving up six runs in the 8th inning which put the game out of reach. For the Phillies’ offense, you knew things were going to be rough when Ty Wiggington, 4 for his last 35, was hitting cleanup. Interestingly enough, Wiggington had two hits including a home run and two RBIs in a spot start for Howard against the left-handed Mark Buerhle. Buerhle won his 10th game of the year which gives him ten wins for the 12th straight year. Kendrick outduels Johnson, throws World off its axis. When Philadelphia fans woke up this morning and saw the pitching matchup for tonight’s game, many already chalked it up as a loss. Kyle Kendrick vs. Josh Johnson? There’s no chance right? Well…baseball is a funny game. Jimmy Rollins led the game off with his 41st career lead off home run off and that’s all the scoring that was needed. Kendrick pitched seven shutout innings, scattering five hits while striking out six. Josh Lindblom, who’s struggled since coming over in a trade for Shane Victorino, threw a 1,2,3 8th inning, while Jonathan Papelbon picked up his 26th save of the season. 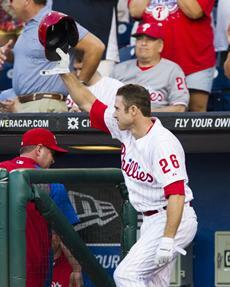 The Marlins out hit the Phillies 5-4, but only had two base runners reach scoring position. With the win, the Phillies move to 54-62 for the season, but 18-11 in the 2nd half. Since the 2nd half, the team has won 7 out of 10 series. Tomorrow, Roy Halladay goes against Mark Buerhle. In his last two starts, Halladay has gone 15 innings, allowing 1 earned run with a 13-1 K/BB ratio. In what will go down as the worst day in franchise history, the Philadelphia Phillies have designated Chad Qualls for assignment. The club has ten days to either trade him, release him or place him on waivers. If Qualls is placed on waivers and passes through, he’ll be sent to AAA Lehigh Valley. A vital part of the Phillies great bullpen, Chad posted a 5.68 ERA in his last 29 appearances after pitching scoreless frames in his first six outings. According to multiple beat writers, Qualls asked to be traded because he’s “a Major League Pitcher” and wouldn’t know what to do in the minors. There’s a strong possibility that the Phillies will trade him for the likes of a Josh Hamilton. Jeremy Horst, acquired in the Wilson Valdez trade, took his place on the 40-man roster and will be in uniform today. The organization also made another move in sending down Joe Savery, another cog in the great Phillies bullpen, and brought up Brian Sanches, who’s likely going to go down as one of the greatest Lehigh Valley Iron Pigs/Scranton Wilkes Barre Phillies of all time. Chase Utley is back and I haven’t posted a lot so here’s a chance for an article. 7:10- Valdes goes 1,2,3 inning. Utley makes the final out and TMac makes it awkward. 7:12- James McDonald pitching for the Pirates. He’s been incredible this year. He has the lowest ERA in baseball since April 19th. 7:15- Utley walks up to the plate and Twitter just exploded. 7:16- Juan Pierre almost gets picked off which would have been the biggest buzz kill ever. 7:18- Of course, Pierre is caught stealing. Thanks for the Buzzkill. 7:19- Chase homers and social media just broke. 7:20- James McDonald has thrown three curveballs, two have been terrible and the other ended in the seats. 7:21- Chooch goes back to back. Steals Utley’s thunder. Warren Croxton and his running thoughts while watching 3 Philadelphia teams in action. 7:00- So with three Philadelphia sports teams in action, I thought it would be cool to write down everything I thought during the games. Mostly going to be Flyers and Phillies, but with some Sixers thoughts. 7:03- Marc Zumoff said Cleveland is a nice place to play. I completely disagree. It was an awful place to visit. 7:08- Random MLB thought- the Blue Jays uniforms are awesome. 7:09- Mike Sweeney on my screen! He’s the man! Hugs for everyone. 7:11- My girlfriend is already bored.